Traveling Bells: National Wear Red Day! Did you know that one in three women will die from cardiovascular disease? Wear RED today in support of women's heart health. 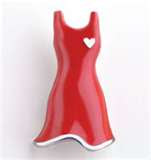 Visit the American Heart Association and Go Red for Women to learn more. Start changing your lifestyle NOW to protect your heart. It's the only one you've got! Shamelessly stolen from Haley as a mother is privileged to do......AND because I was on the board of the American Heart Association for quite a number of years there in Mayberry and this is a subject that is close to my heart. Literally. Plus.......Friday is always wear red day to support our troops. Today my RED is doing double duty. I'm bleeding from kitten scratches, so I hope that counts as Red, because I'm wearing a green sweater and blue jeans. Ut-oh, I'm wearing a purple fleece sweatshirt because it's so cold up here but my cheeks are red from being out in the cold chasing trains again - does that count?? Have a lovely Friday - no matter what color it may be! I live in gang country and I'm not wearing red here. Just saying. What a great cause though. I'm impressed that you were on the board for many years too. Good for you. Today i sure was not wearing red: dinner at a restaurant, party at my granddaughter Agnese, eleven...so I charged my heart...tomorrow I'll wear red!!!! Shamelessly steal away for a great cause! today at macy's 20% off for wearing red!